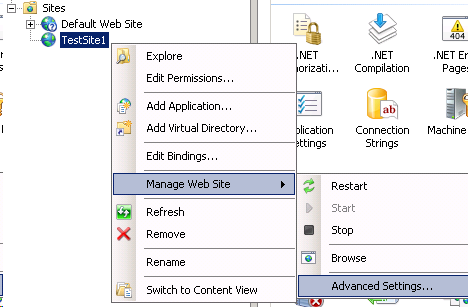 Configure IIS Shared Configuration and site redirection. I’ve recently started on a project that required IIS7.5 to be load balanced using windows network load balancing, part of the proposal was to describe how were the two web servers going to keep in sync, there were several options open to us. After reviewing them all we proposed to have the two server load balanced using windows network load balancing, connected to the same IIS configuration using the built in “shared Configuration” tool, and then hold all the web data such as the sites and content on a Windows clustered back end file share. 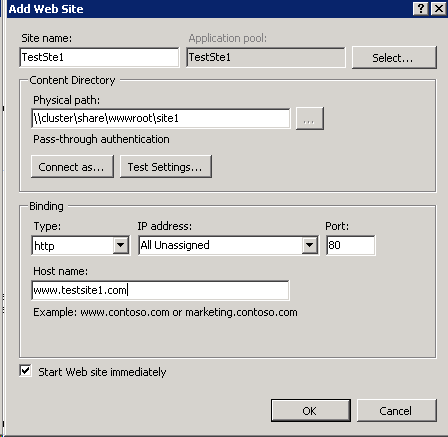 For the benefit of this post I’m not going to blog how to set up a pair of windows network load balanced servers, but i will document the steps you need to take to configure content sharing and how to redirect a site to a UNC path on a backend cluster share. First off we will configure the steps to share the IIS config between the two web servers for this i assume you already have two servers with IIS role installed, and a shared volume that both servers will be able to see. 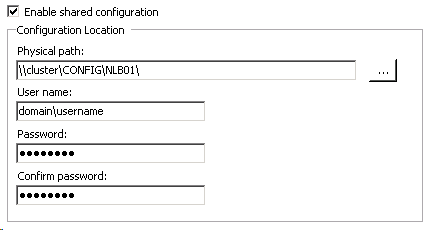 On one other web servers launch the IIS manager, in the left pane highlight the server name as pictured below. 2. 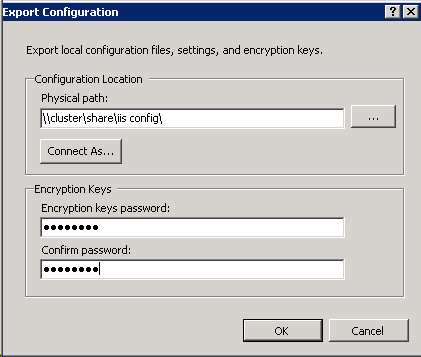 In the in the centre pane, then open shared configuration. 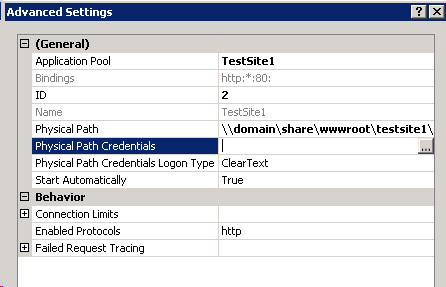 Fill in the details for the share that you have created that both web servers can see. 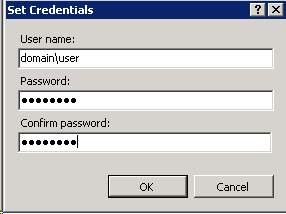 Enter an encryption key (this is a password that will be needed to add nodes to the shared configuration). the next step is to add the nodes to both share the configuration. 5. Restart IIS to apply the configuration, Repeat the impost on the other web server and hay presto, the servers are sharing the configuration and to test if you create a new site on one of the web servers you will see that is is mirrored on the other server. The next part to the blog is to redirect the site content to ensure both web servers are using the same web content file, the benefit to this would be there would only be one location to upload new content to, you are sure that the content on both servers are the same. Only a few steps to ensure that this is correct, and if you have already done steps above to share the configuration you will only have to do this on one of the servers as the configuration is mirrored and will automatically be replicated onto the other web server. 3. Under the physical path section enter the UNC path to your clustered share. (this share again needs to be accessible by both web servers. 6. Test the web site, and if you have configured the NLB content sharing as above look on the other web server and you will notice that the settings are visible and matched on both. Hope this helps someone along the way.